Time has again come for our third New & Emerging Communities Festival. After a successful first & second NEC Festival, we are ready for the next one. 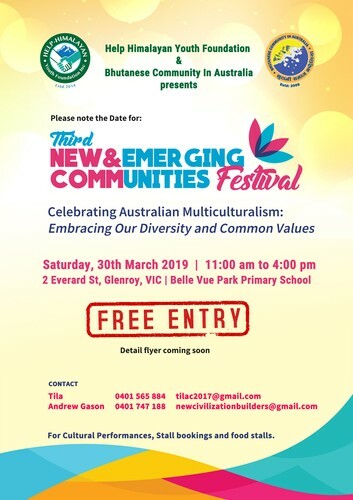 Let us all celebrate our diversity, success of our Multiculturalism that makes our Australian society more inclusive, cohesive and our way of life. Please share in your network and contact the details provided in the flyer if you and your group would like to participate. More details with supporters, sponsors & exciting programs to follow!